It’s worth $2.7 million today. After just two short months of sitting on the market, Marilyn Monroe and Joe DiMaggio’s former Hollywood Hills home has officially sold for $2.7 million. The pair rented the Mediterranean-style abode shortly after they began dating in 1952. While the couple’s romance didn’t last long, there’s plenty to love about their former nest. Situated in the luxury Outpost Estates neighborhood—an exclusive area overlooking Runyon Canyon—the four-bedroom, four-bathroom home sits cozily against the grassy hillside. Multiple balconies adorn the back exterior of the 1930s-era home, offering scenic views of the lush 8,228-square-foot lot. According to Mansion Global, a canceled check from the time shows that Monroe was listed as the renter of the home. The check, of course, also revealed how much the star was paying for the serene spread. Her monthly rent? $237.82. While Monroe’s monthly dues were relative to the time, the bill is enough to make any 2019 Los Angeles resident envious—particularly when you consider what she was getting for her money. Terra-cotta tile floors, wood beam ceilings, and iron railings all lend a decidedly Spanish-inspired feel to the quaint space. French doors lead out to the upper terrace just off the living room. The covered veranda is one of many sunny spots where the beloved actress and her former New York Yankees husband would have hosted star-studded outdoor fetes. Bearing a close resemblance to a countryside villa, the kitchen boasts a colored tile backsplash, a small central island, and an A-frame structure. Consider this proof that charm trumps size. Multiple fireplaces can be found throughout the 3,335-square-foot retreat, but our favorite has to be the whitewashed brick one in the master suite. The cozy focal point seemingly stands to rival the master bathroom, which is outfitted with built-in shelves, a dark-bottom soaking tub, a separate glass-enclosed shower, and an antique-inspired vanity. When the luxe soaking tub doesn’t suffice, the home’s new owners can seek solace out back where a grotto-like pool looks out over a canopy of trees. 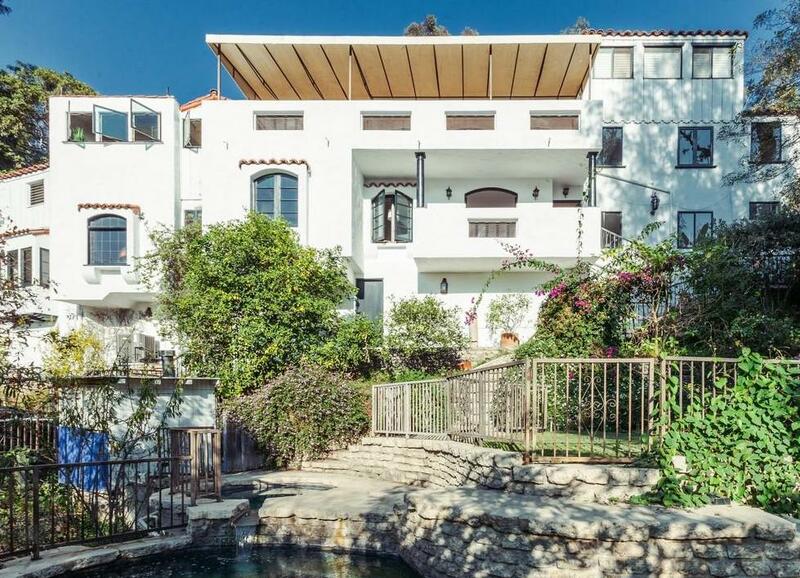 The Hollywood Hills getaway is just one of many Monroe-approved homes to hit the market in the past few years. The Westchester home where she wed playwright Arthur Miller was listed back in the summer of 2017. Her Brentwood bungalow also sold around this same time. Decidedly Monroe’s best catch to date, it’s safe to stay the star was as talented at acting as she was at negotiating her rent.